I’ll let you in on a little secret. Here at the World Headquarters, we step away from the computer screen at lunch time, usually to watch the big screen. Generally it’s a whip around through the various news channels to make sure that it’s worth continuing to work the rest of the day. After all, if the world is going to end, I’d rather try to sneak in one last round of golf than write a few more emails. One thing I’ve noticed lately as I watch CNN/MSNBC/FoxNews during lunch is how little actual content I see. Mostly I see ads. After many years in the TV business I understand why, but when you factor in national breaks, promotional spots, and the local cable affiliate breaks, a viewer can leave the set for 5+ minutes at a time and not miss a thing. Entertainment programming doesn’t seem much better. Then again, maybe I’m just old and cranky and wrong. Almost every major TV network in the US is stuffing more ads into their commercial breaks in a “desperate” attempt to prop up ad revenues as ratings across the industry decline, according to a report from investment research and management company Sanford C. Bernstein. The report shows that prime-time TV audiences (as determined by Nielsen C3 measurements: TV watched both live and three days after the show was first aired on catch-up services) are down 9% year on year, yet ad loads on some networks are up as much as 10% on last year. 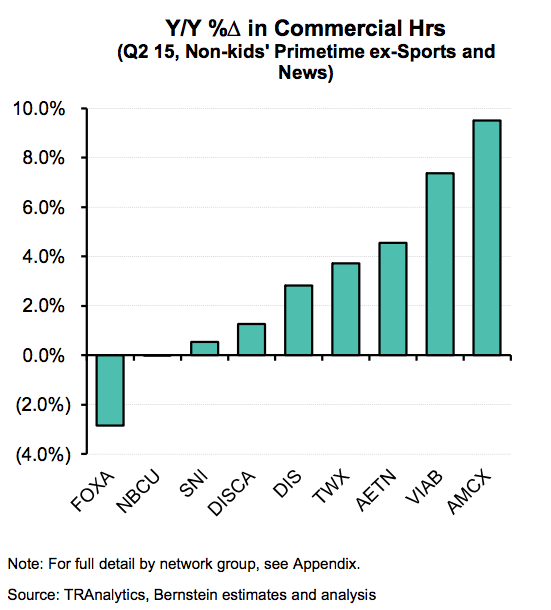 The chart I’ve embedded shows how commercial hours have changed in the last year across major cable network groups. 3% or 4% may not sound like a lot, but when you’re running over 10,000 seconds of commercials a day, that’s several minutes more each day. Times 7. Times 365. The problem with that is that in the process of maintaining revenues you’re exacerbating the problem of viewer abandonment. In particular, viewers are going to streaming, where commercials loads are way smaller if they exist at all. What I find nice about the commercials on Hulu, for example, is that you know exactly how long they will last. I have no clue as I’m taking my short lunch break if I’m ever going back to the news. In this case, no news is very bad news since it means yet more of what I definitely did not tune in to see. We can’t alter our products to preserve an income statement when that alteration provides a lesser experience for the consumer. It’s a short-term fix that will have very bad long-term ramifications. Cheaper ingredients, lesser workmanship, or ad cramming are all part of the same mindset. It’s one we should avoid, don’t you think?